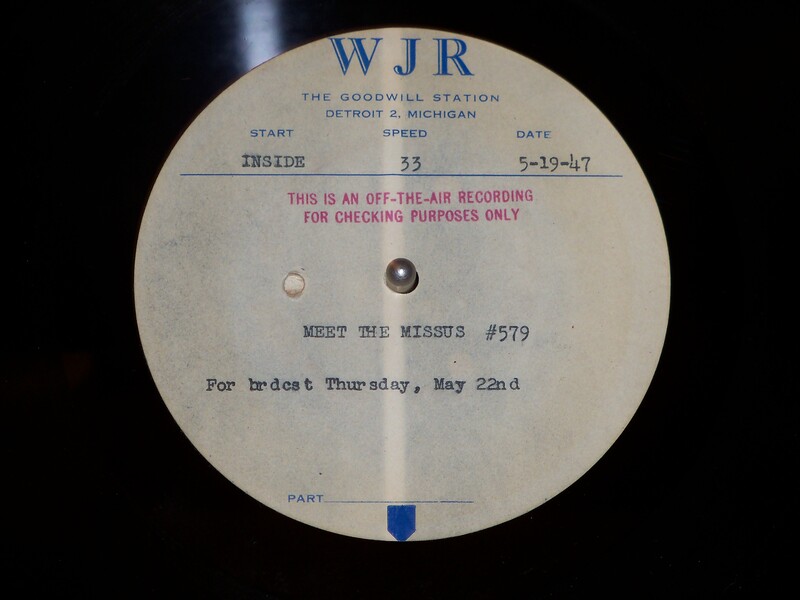 This is a pretty strange show, produced locally at WJR and hosted by Ron Gamble. While the turkey was in the oven today, I was able to digitize a few more records. I should be able to keep these posts coming! Today I have Art Linkletter’s House Party from May 21, 1947. This CBS program, hosted by Franklyn McCormick, takes letters from listeners requesting songs and sends a bouquet to those whose letters are used on the air. One selected letter-writer who is also having an anniversary receives a “golden gift” of “beautifully matched rings in 14 karat gold.” Caesar Patrillo, Louise King and Billy Leach sing. The orchestra isn’t credited. I don’t know the exact date of this recording, but he mentions that Oklahoma! had opened in London a few weeks prior. That opened on April 30, 1947, so I’m assuming this is from mid or late May. 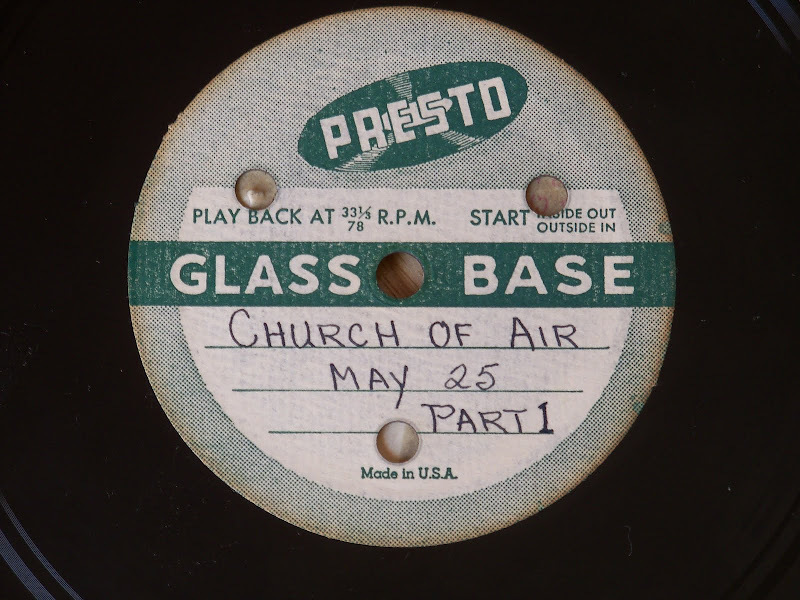 That lines up with what’s on the reverse: “Church of the Air” from May 25, 1947. 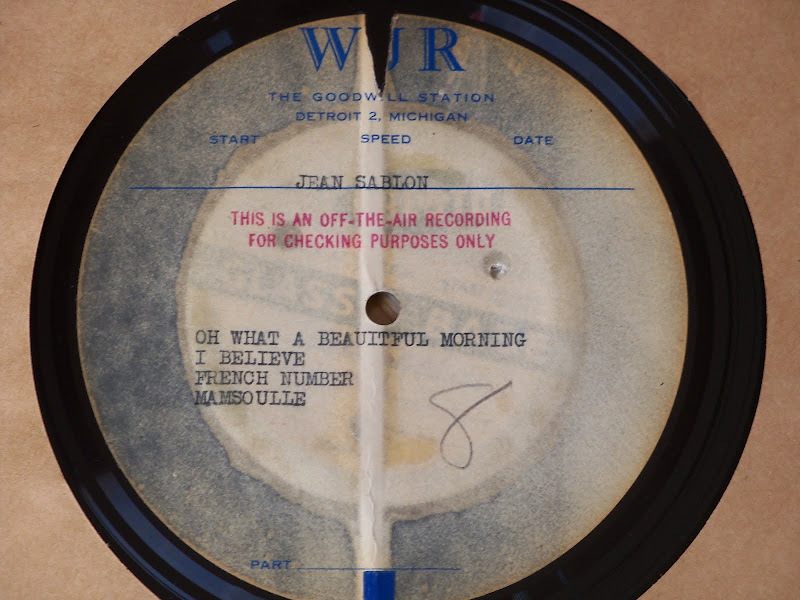 On this program, Jean Sablon sings “Oh What a Beautiful Morning,” “I Believe,” “Je vais passer in soiree formidable,” and “Mamselle.” There are also some advertisements for DuBarry cosmetics. The quality of this recording degrades as it nears the end. That’s been a pretty common problem for me. These records all play from the inside-out, and a lot of them have small cracks in the lacquer near the edges of the record. I assume it’s from years of stress from being stored on edge, as well as small bumps and dings as they’ve been handled. I picked something that I think is really fun for my first post at the new site. This is a locally-produced show from WJR. The basic premise is to have a group of women come in and try to answer a few questions quiz-show style, but mostly the point seems to be to make the ladies look silly. They do quite a good job of it. There are some things in this recording that I find really interesting. Every woman who is chosen gives her complete name and address on the air. Actually, not her complete name; most of them identify themselves as Mrs. (husband’s complete name). Some gave their first names in the course of the conversation, but most don’t until asked for it. The only lady who gave her first name voluntarily wasn’t married; this was confirmed by the host. This group of women are from the PTA at Hubert School, which was in the Brightmoor neighborhood of Detroit and closed in 2005. Another really interesting note in the recording is one woman mentioned that she and her family moved to Highland Park to get out of the city. She talks about how hard it is to see her old friends from Brightmoor since she’s moved way out in the country. Anyone from Detroit should find this amusing. If you’d like to know more about Hubert School you can visit www.hubertschool.org, but be aware that there is audio on every page with no button to turn it off. You might want to mute your speakers while perusing the site. The prize given at the end of the show is awesome. I wish I had one. You’ll have to listen all the way through to find out what it is. Here’s the direct link to the audio file at my bandcamp page.